Bayfield Ontario is a beautiful, quiet lakeside village. For many people, it quickly brings to mind images of lazy summer days. But this quiet village is also one of the largest recreational harbours on the Canadian coast of Lake Huron. Bayfield was founded in 1832 by a Dutch nobleman and named after British naval officer Admiral Henry Bayfield, at one time the Admiralty Surveyor for the Great Lakes. This pleasant village has a number of very nice restaurants, boutiques and art galleries. It attracts not only a lot of sailors but also visitors from cities like Windsor and London. It is a great place to stop over or to spend several days. The approaches to Bayfield Ontario are clear from all directions. There is a wreck (charted) approximately .25 nm south of the entrance and lying about 400ft / 20m offshore. The harbour entrance can be hard to see. There are 2 F GREEN range lights on the north side of the harbour on a bearing of 076.5oT. On the end of the south pier is a Fl RED light. Once inside the channel, proceed upstream. You will find transient docking on either side of the river. Harbour Lights Marina runs almost the entire length of the north shore of the Bayfield marina. It is a full-service marina. 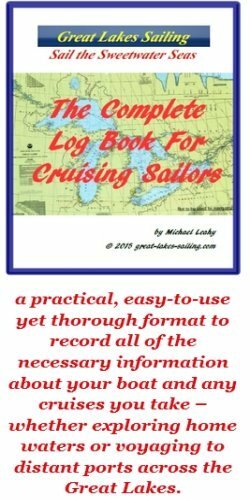 Thay have about 175 slips available with 80 set aside for transient sailors. There is a fuel dock (diesel and gasoline) and pumpout station. Water and power are available dockside. There are washrooms, showers and a laundry. There is full maintenance and repair services and they can carry out a wide range of repairs on enhines, electrical systems, fibreglass and hull and rigging. Amenities include nearby beaches, swimming pool, chiildrens playground and a very well-stocked chandlery. They have a family restaurant with outdoor patio and deck overlooking the river. There is a motel and they have a shuttle to take guests into the town. Bluewater Marina is owned by the municipality. It is located on the south shore of the river as you enter the harbour. There are approximately 60 slips with about 20 available for transient sailors. There is a fuel dock (diesel and gasoline) and a pumpout station. There is water and power available dockside. Washrooms and showers are also available. The marina has a suttle service into town. There are picnic areas and access to the beach. South Shore Marina is located further upriver on the south side of the river. They have several slips available for sailors. There is no fuel dock. There is water and power available dockside. They have washrooms and showers. They also have picnic areas available. There is a Foodland grocery store that will meet most provisioning needs. There are no banking facilities in Bayfield although private ATM's (expensive) may be found. Lighthouse Medical Centre (519) 565-4141 offers walk-in service. The nearest hospital is Clinton Public Hospital (519) 482-3447 located in Clinton, ON, 11mi / 18km east. Michael's Pharmacy (519) 565-4454 is located in the village. There are a number of top-notch and very popular restaurants and pubs in bayfield Ontario. Admiral Bayfield Restaurant is located in a renovated mid-1800's general store. They serve a terrific breakfast (I speak from personal experience here!) and dinner is pretty darn good too! The Little Inn of Bayfield was originally a coach stop in the 1830's. Today it serves excellent meals in a relaxed but elegant setting. The verandah makes a perfect setting for dinner on a warm summer evening. The Inn has 8 lovely suites as well. The Red Pump Restaurant is another gourmet restaurant in the village. It serves up-scale meals in a beautiful dining room and a delightful garden. Harbour Restaurant at the Harbour Lights Marina is a family restaurant with a varied menu that can be enjoyed indoors or out on the patio/deck overlooking the marina. Bayfield Ontario is a beautiful little village that really does lend itself to just strolling and wandering through local galleries and interesting antique shops. These, and the ndifferent boutiques in the village attract shoppers from a very wide area. The beaches are another draw. Bayfield has three beautiful beaches and there are parklands all along its shoreline. This Bayfield Ontario site will give you some idea of what Bayfield has to offer.